Our mission is to connect individuals who lived or worked at Hong Kong orphanages and children homes such as: Fanling Babies Home (粉嶺), Po Leung Kuk (保良局), Shatin Babies Home, St. Christopher’s Home (聖公會聖基道兒童院), Chuk Yuen Children’s Centre, Precious Blood Orphanage in Fanling (寶血兒童村), Ling Yuet Sin Infants’ Home (凌月仙小嬰調養院), St. Paul de Chartres, Evangel Children’s Home, Yuen Long Children’s Home (元朗兒童教養院), Eric Bruce Hammond M. Orphanage, Pine Hill Village Babies Home, Clarks Children’s Home and others. Former residents from those orphanages contact us when they find this website. We put you in touch with fellow adoptees from your respective orphanage and with caregivers that we have found. The best way to learn about your orphanage history and search for your lost roots is to meet your fellow orphanage brothers and sisters. After all, we are the first family you can remember even if it is a very faint memory. 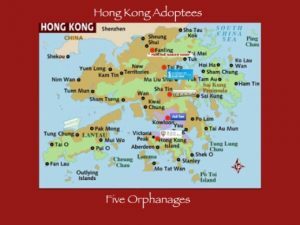 Our group continues to grow as Hong Kong adoptees and former residents from Hong Kong orphanages discover each other by contacting us at this website. We hold regular reunion meetings in our adoptive countries primarily: England, USA/Canada, and New Zealand. Our first Hong Kong Reunion back to our motherland was in 2010. Our second Hong Kong Adoptee Reunion was in November 2015. Read about our reunions and how you can participate. We provide a supportive network for former residents and staff members, supporters of Hong Kong orphanages, adoptees, parents, and families to reconnect, learn about their past, and share their experiences. Some of us have found our birth family and can thus advise you on your search. We welcome and invite you to contact us, share in our body of knowledge, and enjoy the fellowship of those with similar backgrounds. Several political situations led to extremely dire conditions in Hong Kong. During the brutal Japanese occupation, the population fell from 1.6 million to roughly 600,000. Those who couldn’t escape suffered food shortages, unemployment, homelessness and even death. The population swelled again when former Hong Kong residents came back after WWII ended. Refugees fled to Hong Kong to escape the Chinese Civil War and the Great Chinese Famine. But Hong Kong was still struggling to recover from the devastation of WWII. Many immigrants, refugees and locals found themselves unable to adequately care for their babies and children. Initially, the British colonial government in Hong Kong was unprepared to provide social services to these needy souls. Fortunately, a number of local citizens, Christian missionaries and charitable organizations in Hong Kong rose to the occasion and provided social services for those in need. In particular, missionaries established a number of hospitals, orphanage homes, homes for the blind, schools and so forth. Po Leung Kuk, established in 1878, focused on protecting kidnap victims and orphans. Fanling Babies Home provided shelter for abandoned babies during the Japanese occupation and the Mainland refugee crisis. Evangel Children’s Home opened in 1956 to provide a Christian home for the growing number of orphans. These are just a few examples of the orphanages in Hong Kong that came to our rescue. 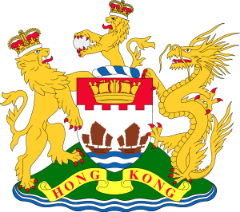 Hong Kong became a center of missionary activity when China expelled the foreign missionaries. A large exodus of these missionaries resettled in Hong Kong. Using Hong Kong as a base, they resumed their charitable missionary work. They had experience in operating orphanages and children homes in China. They brought that knowledge and passion to Hong Kong. We are indeed blessed and grateful for the difference they made in our lives, their young wards. Foreign missionaries and concerned private citizens started the first orphanages in Hong Kong. 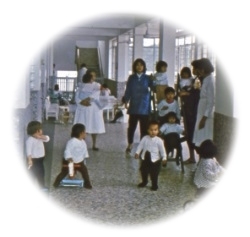 During the peak occupancy years, 1950’s through the 60’s, these Hong Kong orphanages provided much needed services to the destitute children often found on the streets. The Hong Kong Government contributed funding in some cases but relied on the help of these charitable organizations. They took in babies and children whose parents could not care for them due to poverty, death of one or both parents, special needs children, or babies born to young unwed mothers. Unfortunate circumstances like these occur in every country during periods of distress. Po Leung Kuk was one of the first established orphanages. St Christopher’s Home was one of the largest Hong Kong orphanages. Fanling Babies Home and Shatin Babies Home were founded by the same missionary woman. Chuk Yuen Reception Centre was a government orphanage. We give our heartfelt thanks to the men and women who established or worked at our Hong Kong orphanages. We grew up not knowing who they were because when we were adopted we were too young to remember.